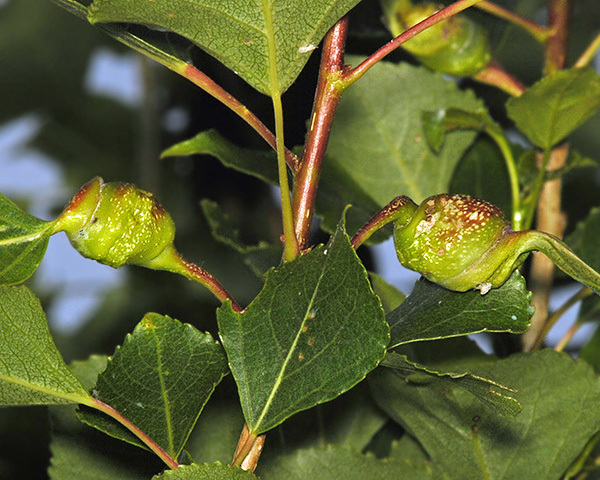 In spring, Pemphigus spyrothecae form green, reddish or yellowish, smooth galls formed by thickening, flattening and spiral twisting of the leaf petiole of Populus nigra (black poplar) with 2-3 twists (see picture below) (cf. the gall of Pemphigus protospirae which is thinner and usually has more than five spirals). The Pemphigus spyrothecae fundatrix is pale green, giving rise to a second generation of apterae within the gall. The emigrant winged sexuparae emerge from the gall in late summer or autumn (cf. the emigrant alates of Pemphigus protospirae which emerge from the gall in late spring and early summer). They have a small oval or rounded primary rhinarium on the fifth antennal segment, no larger than that on the sixth, and fringed with very fine short hairs. (cf. Pemphigus protospirae where the primary rhinarium on the fifth antennal segment is larger than that on the sixth, and is not fringed with hairs). The emigrant alate of Pemphigus spyrothecaehas no secondary rhinaria on the fifth and sixth antennal segments (cf. Pemphigus protospirae which has 2-4 secondary rhinaria on the fifth, and 2-8 on the base of the sixth). Pemphigus spyrothecae does not host alternate, but remains on Populus nigra (black poplar) all year. The fundatrix gives rise to a second generation of apterae within the gall, and the alate sexuparae emerge in August to November when they produce males and oviparae on the bark (cf. the emigrant alatae Pemphigus protospirae which leave the gall during late spring to early summer). The poplar spiral gall aphid is found throughout Europe as well as in North Africa, western Siberia and Pakistan, and has been introduced to Canada. The picture below shows developing alate sexuparae of Pemphigus spyrothecae inside the gall. Aoki & Kurosu (1986) describe how Pemphigus spyrothecae produces first instar larvae of two types in the gall: thick-legged ones, and normal-legged ones. It was found that the thick-legged larvae play a defensive role, hence acting as soldiers. 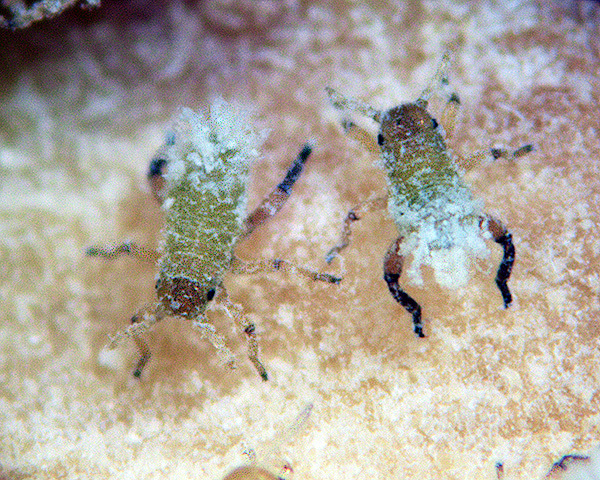 Soldiers of Pemphigus spyrothecae are shown in the image below. Unlike the soldiers of other species hitherto reported, at least some Pemphigus spyrothecae soldiers moult and become adults. Aoki & Kurosu suggested that their incomplete sterility evolved in the following way: The migratory ancestor of Pemphigus spyrothecae once produced monomorphic first instar larvae attacking predators in the gall. It acquired a non-migratory life cycle by the larviposition of emigrants in the gall. 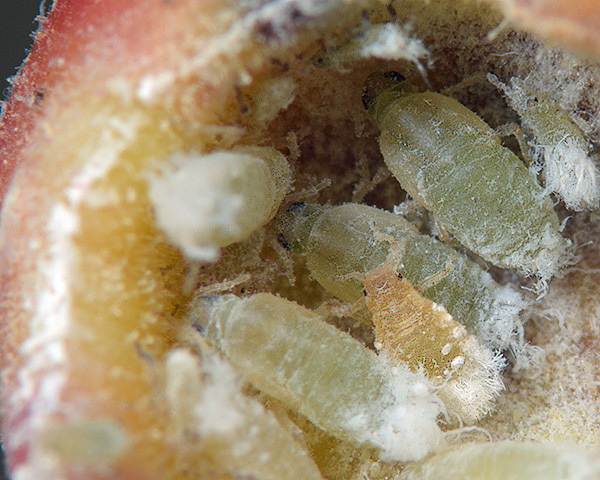 As a result, first instar larvae of another morph, which had lived on the secondary host without attacking predators, joined the gall inhabitants. This hypothesis is supported by the fact that the normal-legged first instar larvae very much resemble the first-instar larvae of migratory Pemphigus species produced on the secondary hosts. Pike et al (2007a) noted that the strategic placement and aggregation of certain castes within the nests of eusocial insects such as bees and ants results in complex colonies that enjoy increased fitness through improved efficiency of social tasks. 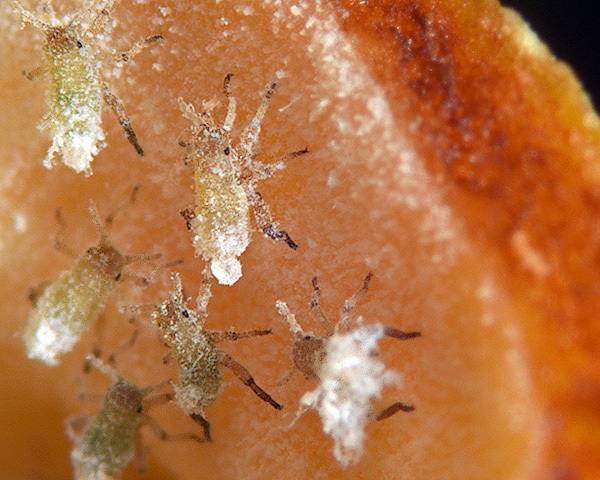 To examine if this advanced social phenomenon might apply to social aphids, the location of the numerous morphs within the nests (plant galls) of the aphid species Pemphigus spyrothecae was examined. A strong, almost exclusive tendency for soldiers to occupy the gall section nearest to the opening was detected. The picture below shows the soldiers aggregating close to their gall opening. In addition, it was found that the most reproductively valuable morphs, the mature gall reproductives and the adult gall emigrants, tended to locate themselves in the gall section furthest from the opening, as shown in the next picture. The defensive morphs are thus ideally placed at the point most vulnerable to predation while the morphs most directly responsible for the colony's fitness are located in the safest area of the nest. Furthermore, the propensity for soldiers alone to be located at the opening provides excellent supporting evidence that they are also the agents of gall cleaning and repair. These observations demonstrated that relatively high levels of spatial complexity can occur within the galling colonies of the social aphids, just as they occur within the advanced societies of other insect orders. Pike et al (2007b) compared Pemphigus spyrothecae with two other Pemphigus species. Pemphigus spyrothecae is a highly social species with aggressive morphologically-specialised soldiers. It has the longest galling phase, experiences unsynchronised development of a large number of individuals in a densely-populated gall, and has an extended period over which alates emerge. Pemphigus populi is a species with no soldiers. It has the shortest galling phase, has synchronised development of a small number of individuals in a sparsely-populated gall, and has an extremely brief emergence period. The ecology of Pemphigus bursarius, which has behavioural soldiers that are not morphologically specialised, is intermediate between these two extremes. The galls of Pemphigus spyrothecae and Pemphigus bursarius form small openings during the course of the season and predation-related mortality is relatively high in these two species. Conversely, predation does not occur during the galling phase of Pemphigus populi, which has no soldiers but makes an entirely-sealed gall. It was concluded that the life-history strategy of Pemphigus spyrothecae appears to be geared towards defending the colony against the constant threat of predation that faces the inhabitants of a long-lived, open gall. 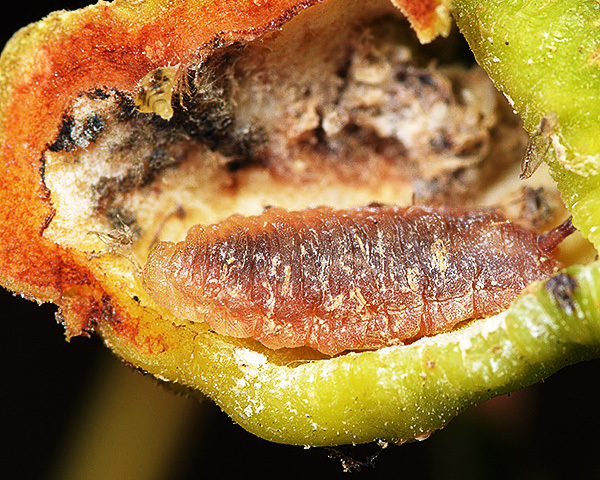 The life-history strategy of Pemphigus populi, on the other hand, is to avoid predation in the closed gall fortress and flee for the secondary host at the earliest opportunity. The life-history strategy of Pemphigus bursarius appears to represent a compromise between these strategies. Urban (2002) looked at the occurrence, development and natural enemies of Pemphigus spyrothecae in Brno, Czech Republic. Fundatrices matured in the first half of June and during the first half of summer produced about 50 offspring. Parthenogenetic females produced about 10 offspring which developed into winged sexuparae. These started to occur in galls from the beginning of August. In galls with intact development, on average 500 aphids developed. About 5% of fundatrices died in the first instar and another 3 to 6% in each of the higher instars. 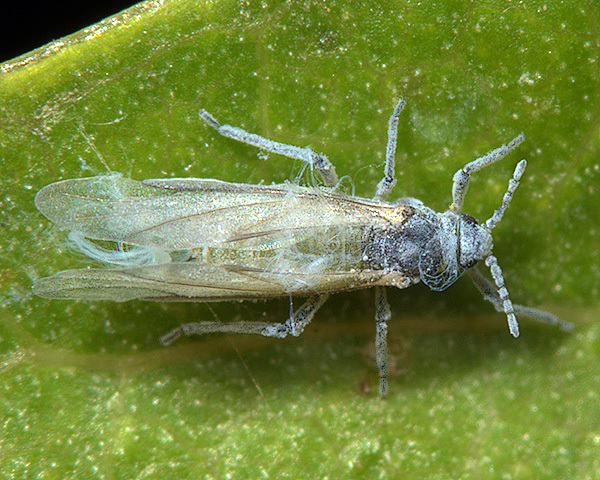 7.5 to 39.0% of galls on black poplar and 3.9 to 13.7% of galls on Lombardy poplar were occupied by larvae of the fly Leucopis puncticornis (Chamaemyiidae). About 24.3 to 32.2% of galls on black poplar and 23.3 to 49.3% of galls on Lombardy poplar were occupied by the bug Anthocoris minki (Anthocoridae). Syrphid fly larvae Heringia heringi (shown in picture below) and Pipiza festiva were found in 3.8 to 30.4% of galls on black poplar and 6.5 to 6.8% of galls on Lombardy poplar. In August at the beginning of the formation of winged sexuparae, the majority of galls opened through primary slit-shaped or oval emergence holes. Some galls (7.8 to 19.5%) with so far intact development remained closed and all aphids contained in them were found to have died. Diseases (particularly mycoses) were often responsible for this. Pemphigus spyrothecae has been recorded from 10 Populus species. We especially thank Alan Outen Bedfordshire Invertebrate Group, Colin Carpenter Flit Bonsai, and Jordans Mill Historic Mill and Gardens, Bedfordshire. Our thanks to Willem Ellis for spotting an earlier gall identification error on this page.